The Skinny: Stephen Chow is funny, but the gangster life is not in this irresponsible mixture of triad bloodshed and wacky comedy. by Kozo: Mystifying combination of a triad saga and wacky comic antics. 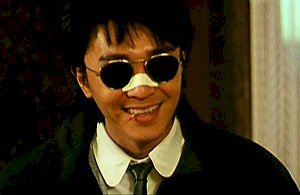 Stephen Chow stars as a lovable waiter who reads gangster comics and dreams of the heroic bloodshed life. His chance comes when he saves a mob boss and joins the triad. Joining him are Wilson Lam as the Chow Yun-Fat clone, and Ann Bridgewater as the obligatory moll.